CHECK OUT OUR BLOG FOR THE LATEST PRODUCT NEWS! 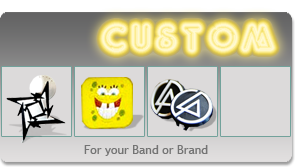 What are Budclick earbud accessories? 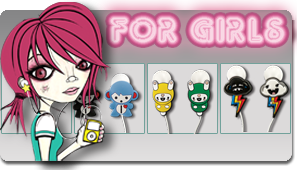 Budclicks are earbud accessories that click on to your white iPod or iPhone earbuds. They allow you to change the attitude of your earbuds without having to buy new headphones. 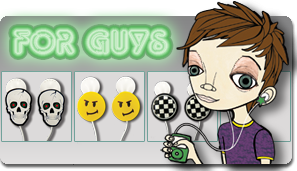 What earbuds do Budclicks work on? Budclicks patent pending design works on both styles of earbuds made by Apple. We have seen people click them on PSP buds, JVC GUMY BUDs, and Intec buds. They are not made for them but they appear to work. Where can I buy Budclicks? Ask your local fashion, accessory or music store if they carry them. If not, then you can order from this website. How do I put Budclicks on my Earbuds? Gently push the “click” at an angle onto the white stem of the earbud. Another way to attach the Budclick is to slide it onto the stem from below. Will they damage my Earbuds? No, Budclicks will not damage your earbuds. How do I become a Budclicks Vendor?